…you took at face value claims made by former sitcom actress turned obsessed anti-Scientologist who now gets paid to smear her former faith. As a Scientologist in Nashville I found your column in the Marshall County Tribune on Scientology and global warming to be harshly critical of what you really don’t seem to know much about. It is clear to me that you have no direct knowledge of Scientology. Instead, you took at face value claims made by former sitcom actress turned obsessed anti-Scientologist who now gets paid to smear her former faith. You should have reached out for the other side of the story, to the people who are actually Scientologists. This is the defining line that separates the journalists from the sensationalist. I want you to know that our Church is active in working with other faith groups. We work with children to promote healthy living without drugs, educate people on their human rights and oversee numerous other faith-based initiatives aimed at helping others of different religions, races and cultures. Scientologists work everyday to help this world become a better place for all of us to live. My point is that we all have a right to our own religious beliefs. And we don’t denigrate the faith of others, as many others do. It is this practice that is largely contributing to the current climate of hostility and non-acceptance occurring in America and across the world right now. 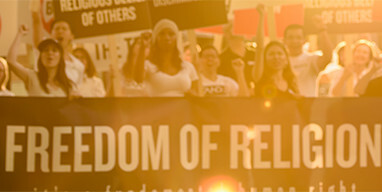 In Scientology, we respect the beliefs of others and treasure the religious freedom all of us enjoy in America. We don’t discriminate, but we do stand up for our rights and the rights of others to peacefully and without harassment practice their faiths. There is plenty of material in all religions for the uneducated and quick-to-judge to point to and scoff at. Religion is a personal experience and the scriptures of all faiths can only be understood within the framework of the religion concerned. I am sure you can think of a handful of common religious beliefs yourself that would be rejected by people of other faiths or cultures who weren’t educated toward acceptance and tolerance. This is why civil people really do respect the beliefs of others and don’t merely say they do while at the same time forfeiting that notion for money or fame at the expense of a minority or lesser-known group. It would be nice, and wouldn’t take too much of your time, if you would take a look at a dozen or so of the hundreds of “Meet a Scientologist” videos on scientology’s website. These people are an actual representation of who everyday Scientologists actually are, and some of these people are good friends of mine. They are real people. Good people. And there you can view for yourself the individuals you have so sweepingly characterized negatively, and hopefully see in a different light the one-sidedness of the words you put forth to my neighbors as “journalism.” I believe you will find these people intelligent, creative and engaged in life, contrary to the stereotype you portrayed in your column. You may not know it, but there are millions of Scientologists worldwide and hundreds of students of Scientology in just the Nashville area. We are working alongside people of every faith group to make this world a better place. So I do hope next time you decide to write a story about us, keep in mind that we are your neighbors and we have our shoulders to the wheel of the same efforts as you to make this world a better place for everyone.